INTRODUCTION: The 163* series has debuted quietly in 2000 with the standalone 1632, a book that nobody expected to take off in the huge way it did, spanning a series that consists of 7 mainstream novels, 4 side (sort-of) novels, 2 main anthologies with a third upcoming in July and 30+ Grantville Gazettes, a mostly electronic journal dedicated to the series and consisting of both fiction and non-fiction. 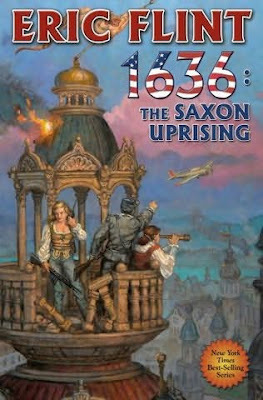 While Eric Flint is the creator of the series and keeps general control, quite a few people contributed to the universe in the Gazettes and Anthologies, while some of the novels have been co-authored with David Weber (1633, 1634 The Baltic War) and Virginia de Marce (1634 The Bavarian Crisis and 1635 The Dreeson Incident) in the mainstream series that consists so far of 1632, these four and the one big volume split into parts: 1635: The Eastern Front and 1636: the Saxon Uprising. The side novels (some are structured as a collection of related series following one another to achieve the unity of a novel) have also various authors but are less important and of varying degrees of quality and interest, so I will focus on the mainstream story threads here. Before discussing the series, I would like to add that this thread that follows the major characters is also treated in some of the Ring of Fire I and II anthologies, but the necessary backstory is recounted in the 7 novels above which form the backbone of the series and are as superb as anything in sff today. If the series would consist only of those 7 plus the aforementioned stories, it would rank as a co-#1 ongoing sff series for me alongside the Honorverse and Safehold, but the generally lower quality of the side novels and the amateurishness of many Gazette stories takes it down a little. Eric Flint often mentions the experimental nature of the 163* project including all those amateur contributions, so it depends on how you look at things - as a sf series for the ages, keeping it to the 7 so far mainstream novels and related stories would have been much better, but as a fictional recreation of a different 17th century the experiment is quite interesting. In the following overview, I will present only the "big picture" that results from the first 5 main books (1632, 1633, 1634 The Baltic War, 1634 The Bavarian Crisis, 1635 The Dreeson Incident). In this way you can jump directly to 1635: The Eastern War and its second half 1636: The Saxon Uprising and follow the action there. If you plan to read the series from the beginning, be aware that what comes below will have massive spoilers for the first 3 books especially. At the time Germany was in the middle of the terrible 30 Year War (1618-1648 our timeline), the most devastating continental war until Napoleon and for Germany until WW2 actually - and in 1632 and 1633 we see how Grantville survives and then thrives by accepting as more-or-less equals and mixing with all "down-timers" that appreciate its tolerance and 20th century values, leveraging its technology and allying with the most enlightened local king, the Lutheran Gustav Adolf of Sweden, to essentially create a modern federal German state that will later be named The United States of Europe (USE) under the Swedish (now) Emperor and essentially bring peace to Germany and ending the 30 Years War "early" in 1633 with several crushing defeats of the catholic Imperial armies of Spain and Austria. But Gustav Adolf's patron, the powerful Cardinal Richelieu of France - who despite being a high ranking prelate of the Catholic Church was the main financier of the Protestant cause in the 30 Years War as prime minister of a France that had as goals breaking the (Spanish and Austrian) Hapsburg "encirclement" of France and keeping Germany weak and disunited - is deeply unhappy with all of that as per the second goal above, so he manipulates all of Gustav Adolf's many enemies into the league of Ostende (catholic France and their avowed enemies the Spanish, protestant England and Denmark and various smaller fish) which starts hostilities by a spectacular smashing of - USE allies - Dutch naval power by treachery. However the USE did not sat idly and created a modern volunteer army and a powerful ironclad navy and in 1634 The Baltic War, the USE navy destroys the allied fleets of Spain, England and Denmark, while its army smashes the French in battle leading to a peace congress in Copenhagen 1634 that enshrines Gustav Adolf as the most powerful monarch of Europe with a triple crown of Sweden (more or less absolute king), USE (constitutional Emperor) and the Scandinavian States (Emperor and suzerain). In England an imprisoned Oliver Cromwell (everyone has read the histories of the future so took measures accordingly) escapes from the Tower with American help and is ready to start the English revolution some years early, in France, Richelieu has to use his only modern surviving troops under young Turenne to face the challenge to his power from the treacherous king's brother Gaston and Spain's success in the Netherlands ironically leads to a break of all the Low Countries from the Spanish rule under a Hapsburg prince true but with strong protestant support and leading to the creation of another powerful buffer state, a reborn Burgundy of yore. In the meantime, former enemy general Wallenstein (who read the future histories too and saw his assassination on his boss, the Austrian Hapsburg Emperor's orders and obviously did not appreciate it) made allies with the USE and carved an independent Bohemia with capital at Prague and started expanding into the east with USE support in return for religious tolerance and the end of serfdom. So this is the big picture at the beginning of the duology 1635: The Eastern Front and 1636: The Saxon Uprising when Gustav Adolf decides to deal with some of his treacherous former allies in Saxony and Brandenburg (Prussia), theoretically part of the federal USE but who tacitly supported the Ostende League. Unfortunately, Gustav Adolf has a thing with the Polish king too - a cousin of the same Vasa family, with the two lines having deeply felt grudges against each other - while the progressive Fourth of July Party has just lost the USE election of 1635 to the Conservatives and the new PM is busy playing politics. Against strong up-timer (American) opposition, Gustav Adolf is ready to invade Poland at the head of the powerful USE German army, despite that Poland was the only major European power that did not meddle into Germany during the Thirty Years war. So of course the invasion of Poland starts to go wrong soon and the resulting events combined with the clear lines of conflict in the USE between the ultra-conservative nobility and the progressives inspired by American ideals - conflict that was mostly subdued when the USE fought for its life against the Ostende League but which now after the decisive victory is coming to the forefront and of which the issues of citizenship eligibility/voting rights and established church are the main focal points - create the backdrop against which the dramatic events of "1636:The Saxon Uprising" take place. ANALYSIS: The 163* series is such a big time favorite of mine for three main reasons. The most important ones are the superb cast of characters and the pitch perfect integration of the Grantville brought modern elements into the 17th century we know from history and the consequent creation of a coherent and very interesting alt-history path. I discussed the second point extensively above, though I will add that the research that goes into the books - a lot of which is published in the non-fiction part of the Grantville gazettes - is staggering as it covers all aspects of 17th century life, from religion, social mores, politics, to technology, science and art. Almost anyone who is known from the period appears at least as a cameo and personages like Rubens - artist and diplomat - play a pretty major role here and there. In recent volumes there is a clear trend towards a fusion of the modern technology and scientific knowledge brought by Grantville with available 17th century methods of production and of course the speculations incline towards massive use of steam power - internal combustion engines are just too dependent on modern infrastructure - hydraulic computers - semiconductors dependence on the whole infrastructure of today is even clearer - and other "what ifs" of technological history that have been relegated to footnotes or hobbyist interest by the path our civilization has taken. Then of course his wife, the highly educated Rebecca Stearns nee Abrabanel of the renowned 17th century Jewish international finance family, former secretary of state of the USE and current leader of the Fourth of July Party - the main progressive party of the USE as the name indicates. Mike and Rebecca are also the proud parents of 3 children, with the adopted three year old Barry just stealing the show whenever he appears (aka the little boy who would have become Baruch Spinoza in our timeline and whom the Jews of Amsterdam had expelled for heresy as a baby handing him to Becky when she was helping the besieged city before the peace - as mentioned, everyone read the future histories...). Also playing a huge role in the novel is the leading revolutionary of the day Gretchen Richter, who has seen a large part of her family massacred in the war by mercenaries and was forced to become a "camp follower" of one of their leaders to protect the survivors and whose quick seduction of and marriage with young Jeff Higgins - currently the CO of the "Hangman" Regiment in Mike's division - was the first test of how Grantville will co-exist with the local people and gave us such memorable scenes in 1632. Other main players in the books are Colonel Hand the cousin of the currently incapacitated Gustav Adolf, while from the villains Prime Minister Wettin gets a better role than I expected, though the Swedish Chancellor Oxiensterna is shown considerably stupider than he seemed - though of course the rush of events can make anyone lose it. Of course the above just scratches the surface of a huge cast and for more details you can check the Wikipedia page of the series where 80 characters, fictional and historical, have biographical sketches though the cast of the series is considerably larger considering the Gazettes. "Banér was not a particularly large man, but he was quite powerful. That blow and the ones that followed with the leg of the shattered stool that remained in his fist were enough to reduce the desk to firewood.“I’ll ***** kill him!" Can you please post the reading order for what you consider to be the "core" books and stories for the series? Thanks! These follow one another and while the 4th and 5th book are less Mike Stearns centric than the rest, they cover the elections, the Dutch settlement and a lot of other in-between stuff.